This “snowy range” offers a multitude of outdoor recreation activities for every kind of enthusiast and environmentalist. When the temperatures rise, California’s best whitewater is supplied by the Sierra snowmelt. You can find a rafting trip close to popular tourist areas like Lake Tahoe and Yosemite. The South Fork of the American River offers fun for just about every age from our Class II Tom Sawyer Float to the Class III runs of the Lower Gorge or Chili Bar sections. Take a 1-, 2- or 3-Day trip on the Middle Fork of the American and soak up the incredible scenic beauty of this “Wilderness” river canyon while rafting the Class III / IV whitewater. In the area to catch a few late season turns in Tahoe? Keep the adrenaline going and catch a ride on the Class IV rapids of the North Fork American. This intermediate / advanced section of the American river will give those just off the black diamond an extended adventure in late April-May. Wind your way through Calaveras Big Trees State Park on the Class IV+ rapids of the North Fork Stanislaus and marvel at the Giant Sequoia Redwoods. For thrill seekers in the Yosemite area, the Tuolumne provides excellent Class IV / IV+ rapids like Clavey Falls in a pristine and remote river canyon. 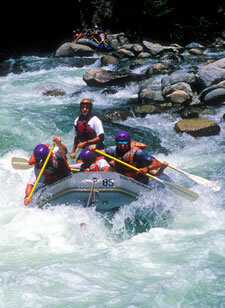 For the ultimate whitewater challenge spend a day on California’s best Class V river, Cherry Creek.